Reports have emerged that Senate leaders have reached a bipartisan agreement on the federal budget. 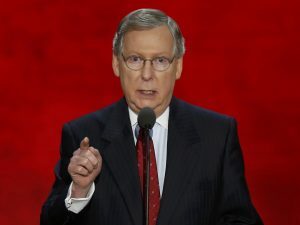 Senators Mitch McConnell of Kentucky, the majority leader, and Chuck Schumer of New York, his Democratic counterpart, have apparently reached an agreement for a short-term spending package that would also raise the federal debt limit. The budget deal and a stopgap spending measure would keep the government open past Thursday, when the current funding measure is set to expire. The deal would add about $300 billion to military and domestic programs over the next two years. The limit on military spending would be increased by $80 billion in the current fiscal year and $85 billion in the next year, which begins Oct. 1. The limit on nondefense spending would increase by $63 billion this year and $68 billion next year. The deal includes $20 billion for infrastructure, $6 billion for the opioid crisis and mental health, $5.8 billion for child care and $4 billion for veterans’ hospitals and clinics. It also includes about $90 billion in disaster relief for last year’s wildfires and hurricanes. On top of the six-year extension of funding for the Children’s Health Insurance Program approved by Congress last month, the agreement includes an additional four-year funding extension. The deal also lifts the debt limit until March 2019. If the short-term deal passes, the next step would be for lawmakers to put together a long-term spending package that would fund the government through September 2019. Lawmakers would have six weeks, until March 23, to pass a long-term funding package.